I didn’t know how to blog about scrapbooking, and I have realised after all the comments on my last post that what people want to read about is the stories behind the photos. Well, maybe that was obvious, but somehow it did not occur to me. I wanted to make a page for Sam’s birth. I had hundreds of pictures to choose from, given that we documented all of the 2 days I spent in labor, and 5 days in hospital postpartum. But already, when I think back, I don’t remember any of that. I have to really think to recall labor – all I know is that the pain really wasn’t that bad for me, even on pitocin. My time in hospital doesn’t seem more than 24 hours, again, unless I really make an effort to recall it. All the nitty gritty, from foley balloons to IV drips, to transfusions and so on just never comes to mind. What I do remember, and what I relive time and time and time again, and what is reflected in the pictures I chose are those 5-10 minutes when Sam actually came into our world. Sam descended really quickly and he was crowning in minutes. I could never feel Sam descend – I could feel the contraction, but only by looking in the mirror did I see if I was making progress. I didn’t want to use a mirror – I thought it would be gross, but the nurses kept asking and asking, so I gave in for an easy life. I was glad I did, it blew me away when I saw Sam’s head crowning. It was all blue and red and white and icky, but absolutely amazing to me to see an actual part my son for the first time. It made me cry and I remember thinking ‘I am going to have a baby!’, it is one of the first times I thought of Sam as a baby, really. That realization, and that excitement, is one of my favorite memories. I pushed and pushed for another 2 and a bit hours, and began to worry whether I could get him out or not. Sam was transverse (just a bit I think, the OB said ‘transverse’ but I guess that has a lot of definitions). My OB for the day, Dr. Dryden, put her hands in and manually turned him each time I pushed. He made fairly good progress when she did that, I think it was just 3 more pushes, but I didn’t know that. By the time the final push came, I had stopped looking in the mirror – it was all hurting so much and I was pushing so hard I was cursing and yelling and trying desperately to focus on all the instructions (don’t hold your breath, don’t push before the contraction has built, legs up, elbows out, think ‘down’). I do remember having a panic and asking if Dr. Dryden needed to use forceps or do a C-section. Her calm words rang very clear to me “No, I don’t need to see him now. I do need to see him soon, but not right now’. I had had so many unsuccessful attempts to get him out, my head was over to my right side and I shut my eyes and literally put everything I had into a push. I had had hours of pushing and nothing, and this didn’t feel any different, so I was shocked when Dr Dryden announced his arrival and I saw him being lifted up! He had been stuck in pelvis for a while, so he had a few more checks than was originally planned and my view was obscured. Sam seemed to take ages to cry – I kept asking over and over again if he was OK, but then he did and but he was wrapped up super quickly and handed to me. I have heard people describe this immense love they felt… Elena at the The Art of Making a Baby describes seeing her daughter Lexie for the first time as realizing she had always loved her. I felt none of that. Honestly, my first thought was ‘Oh my God! I did it! I did it!’, just huge, euphoric disbelief. Then I instantly thought ‘He is safe! Sam made it here safely!’. Wes was crying and saying over and over again how proud he was of me, and I just thought ‘this is immense! It’s a baby! I have a son! Oh my God, I have a son for the rest of my life’. Sam’s face, although I thought it was adorable, just struck me as so alien: I had never seen it before. I didn’t think ‘Oh, this is my son whom I love’ I just thought ‘this is the baby I have to love the rest of my life’. Knowing Sam was mine (ours) forever was overwhelming (in a wonderful, wonderful way). I tried to drink in his features, to etch them on my mind forever because he would be with me forever, but I couldn’t. It was like the enormity of becoming a mother couldn’t be encapsulated by learning a face. They took Sam to be cleaned and weighed and all I knew then was that I really wanted him back. That I really wanted him in my arms. 10 incredible minutes in my life. I don’t ever really look at the pictures of me in labour, although they are cool to have. Everything changed the minute Sam was here: it was all about him then, not me. 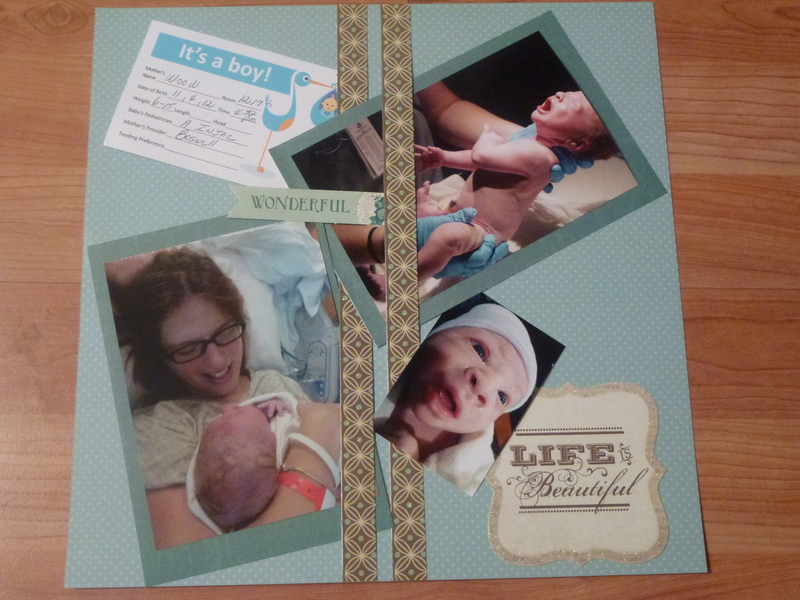 This entry was posted in Craft projects, Scrapbooking and tagged becoming a Mum, Dr. Damla Dryden, moment of birth, pushing, Sam's birth. women's specialists of houston, scrapbooking, transverse baby on January 22, 2013 by Me.